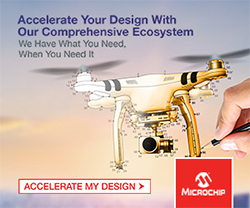 Low-to-mid-power motor controls in the seven to 45V range, can be simplified with the STSPIN830 and STSPIN840 single-chip drivers, claims STMicroelectronics. 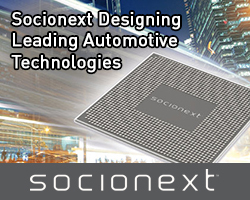 The drivers contain flexible control logic and low-RDS(ON) power switches for industrial applications, medical technology, and home appliances. The STSPIN830 is designed for driving three-phase brushless DC motors and has a mode-setting pin that lets users control the three half bridges of the integrated power stage with direct U, V, and W pulse-width modulated (PWM) inputs, or by applying signals to each gate individually for higher control flexibility. A dedicated sense pin for each inverter leg simplifies setting up three-shunt or single-shunt current sensing for field-oriented control (FOC). The STSPIN840 can drive two brushed DC motors or one larger motor leveraging ST’s paralleling concept, which allows the integrated full bridges to be configured as two separate bridges or as a single bridge using the two sets of MOSFETs in parallel for lower RDS(ON) and higher current rating. 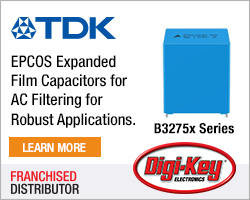 Both drivers contain rich features, including PWM current-control circuitry with adjustable off-time, a convenient standby pin for power saving, and protection circuitry including non-dissipative overcurrent protection, short-circuit protection, under-voltage lockout, thermal shutdown, and interlocking to help create robust and reliable drives. The integrated power stage of each device features ST-proprietary MOSFETs with low RDS(ON) of only 500 milliOhm to combine high efficiency with economy. The option to use the output bridges individually or connected in parallel, in the STSPIN840, helps trim the bill of materials for multi-motor applications. According to ST, the integrated, flexible drivers enable more compact and cost-effective controls for industrial, robotic, medical, building-automation, and office-equipment applications. The STSPIN830 is suitable for factory-automation end-points, home appliances, small pumps, and fans for computer or general-purpose cooling. The STSPIN840 is for use in ATM and money-handling machines, multi-axis stage-lighting mechanisms, thermal printers, textile or sewing machines, and vending machines. 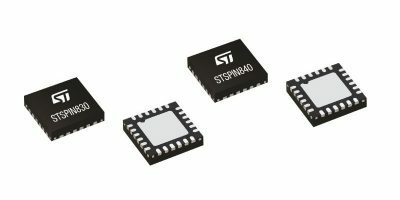 The STSPIN830 and STSPIN840 are both in production now, as 4.0 x 4.0mm QFN devices. Two STM32 Nucleo expansion boards are also available from ST for product evaluation and to build functional prototypes using the STM32 Open Development Environment. The X-NUCLEO-IHM16M1 is for the STSPIN830 and the X-NUCLEO-IHM15A1 is for the STSPIN840 driver.